varies slowly up and down during the year (figure E.16). cordoned off in box E.19 (p306). 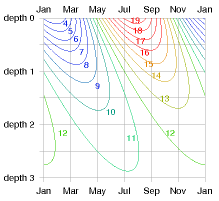 E.17) that shows how the temperature varies in time at each depth. and solid granite, the characteristic length-scale is z0 = 3 m.
Let’s focus on annual variations and discuss a few other materials. (E.9)) that is smaller, the smaller the conductivity. flux ranges from 3 W/m2 to 8 W/m2. Figure E.17. Temperature (in °C) versus depth and time. The depths are given in units of the characteristic depth z0, which for granite and annual variations is 3 m.
At “depth 2” (6 m), the temperature is always about 11 or 12 °C. At “depth 1” (3 m), it wobbles between 8 and 15 °C.